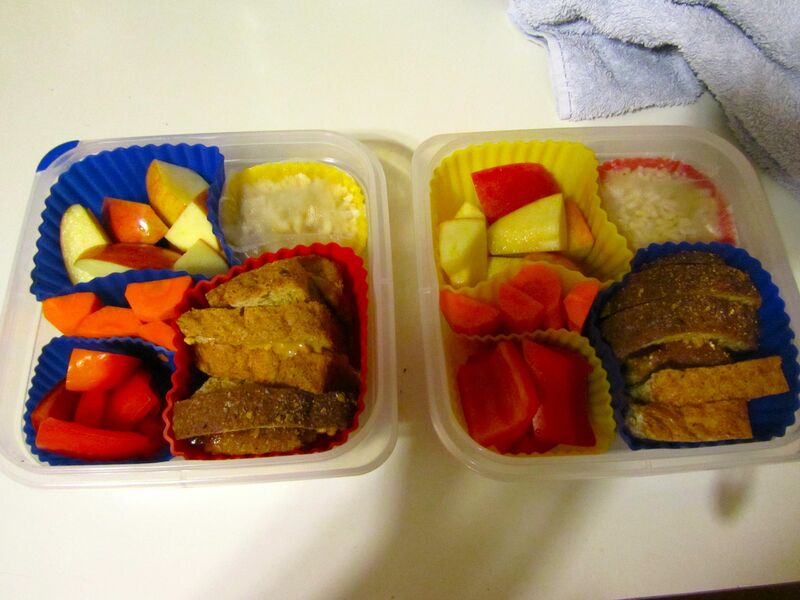 I ate Vegan meals for one month. I “fell off the wagon” on one day, when I was craving red meat. I came home and cooked hamburgers, then proceeded to scarf two down. My husband started looking concerned when I was considering the third hamburger patty. Since then, I’ve mentioned the red meat-craving episode to my doctor (when I happened to be there for bronchitis), and he recommended taking iron pills when that happened. After that month, I continued well on the Vegan path. I’ve been watching more cooking shows and looking at cookbooks. Cooking shows have been the best for me, because it’s more visual, and you can see how the food is prepared. I’ve gotten the most ideas from Chinese Food Made Easy and Healthy Appetite with Elie Krieger, both on the Cooking Channel. After that month, I started craving fried fish and chicken. I didn’t want to eat beans and hummus any more. I would go to Long John Silvers, get a piece of fish for me and a piece for my husband, along with shrimp and hush puppies for him, come home, and then eat both pieces of fish! A couple of days later, I got 2 pieces for me and one for my husband (plus his shrimp and hush puppies), got home, and ate all 3 pieces of fish! I was going to go broke eating at Long John Silvers! Another day, I stopped at Jack in the Box and got their chicken strips. They were so good! So, right now I’m in a wonder zone. I’m wondering if I will continue with only Vegan meals, if I will go back to eating meat and dairy all the time, or if I will only eat meat on occasion. I have a confession to make about my FlyLady work. I did great during the summer time, but once work and grad school started up, I started slacking. I don’t swish and swipe my bathroom every day. I don’t shine my sink every night. My wonderful husband has been helping me out so much. He takes care of the laundry, dishes, and lots of cleaning. He’s been helping more and more with meals. He’s helped me with ironing, and he makes the bed more than I do! What music do you have on your piano? 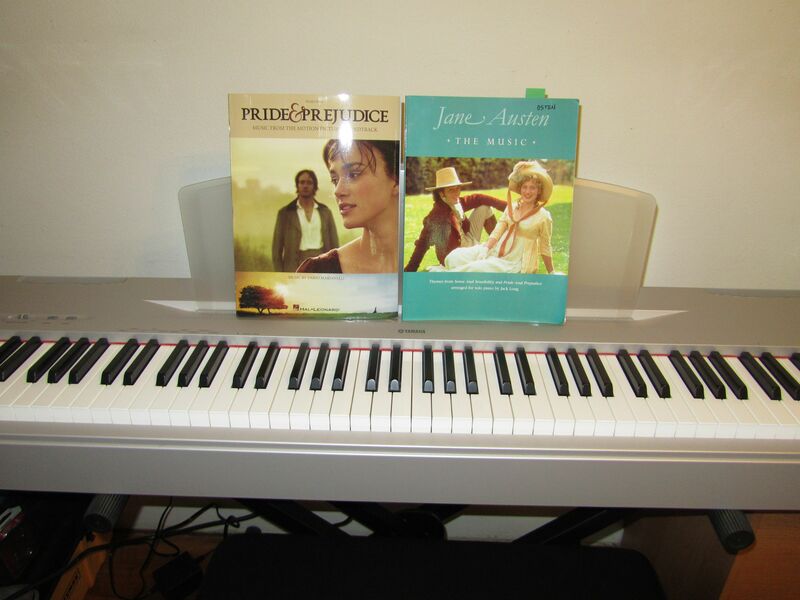 On the left: Sheet music from the 2005 Pride & Prejudice movie. 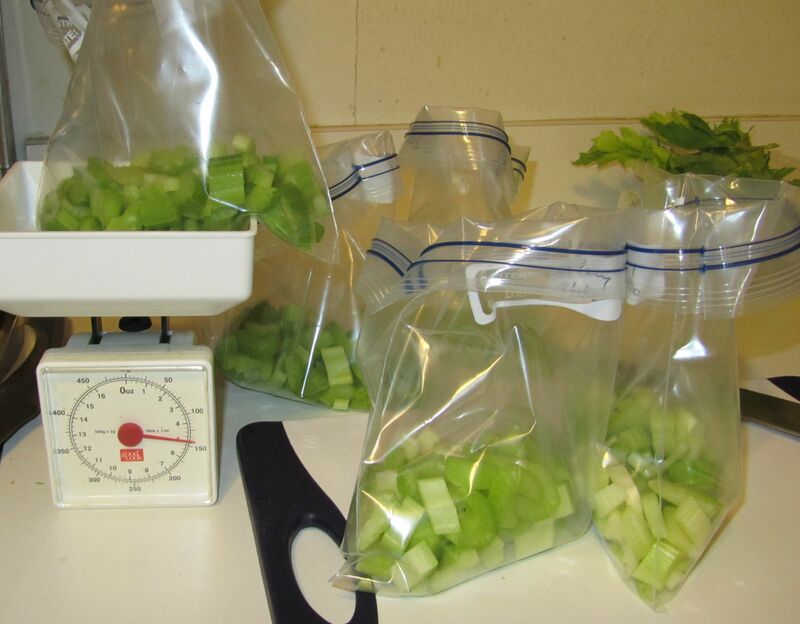 I don’t use celery often, so I buy one stalk, chop it, and freeze it in several freezer bags. 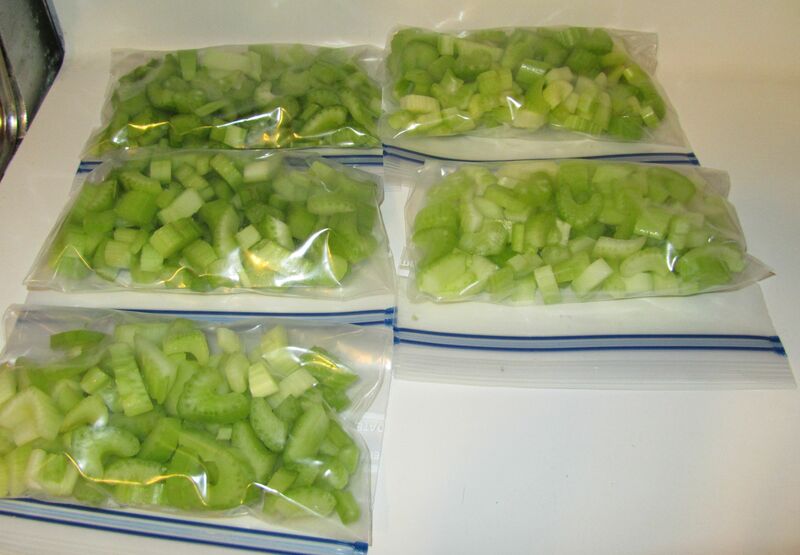 When a recipe calls for celery, I pull out a bag and I’m ready to go! I weighed the bags to make sure they were the same weight. 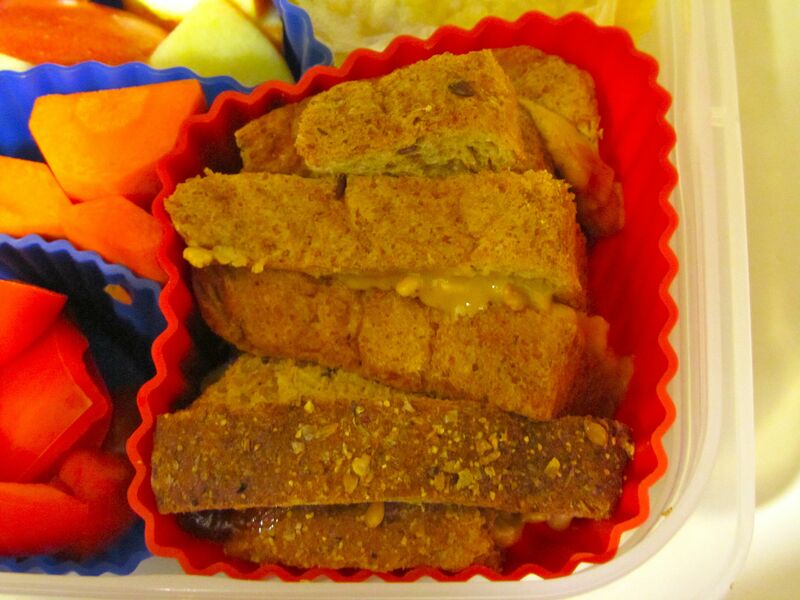 How do I separate food in my Bento lunch box? 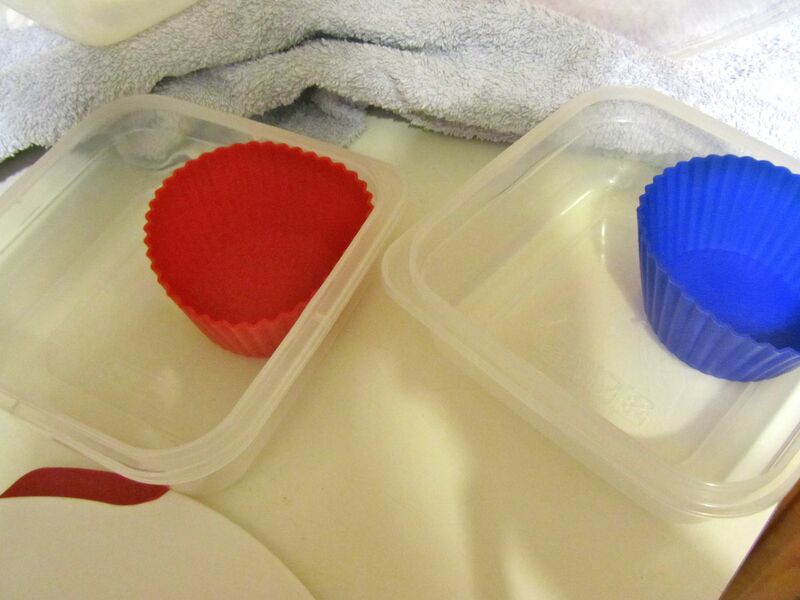 To separate food in my Bento lunches, I like to use silicone baking cups. I got them at my local grocery store, in the aisle with cooking utensils. I have jumbo and regular sizes, but you can also get minis. Wilton (at craft stores) puts out fun shaped ones. When I eat veggie burgers and spaghetti with veggie pasta sauce, my sweet husband will be eating yummy cheeseburgers and spaghetti with meatballs. Together, we made up a large batch for the freezer. Both recipes are from Jamie Oliver’s Food Revolution Cookbook. 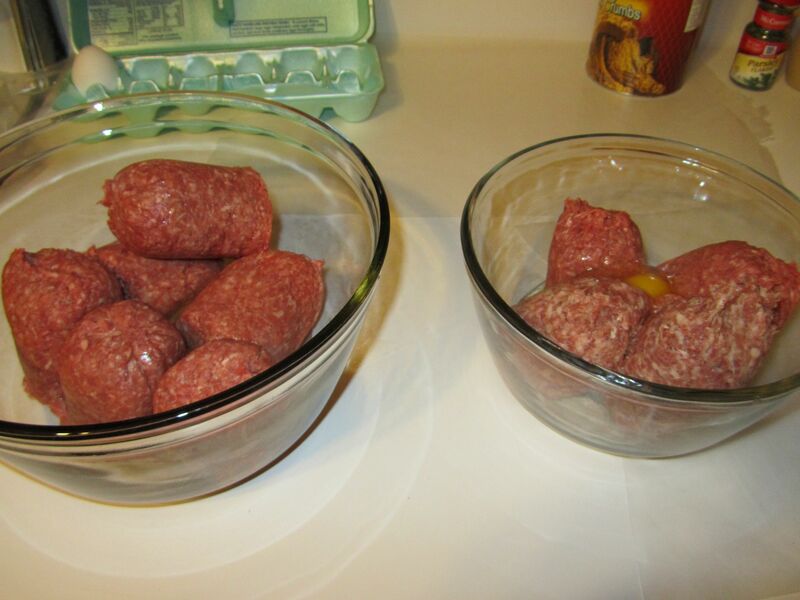 In the left bowl, for hamburgers, we have 3 pounds of ground beef and 3 eggs. 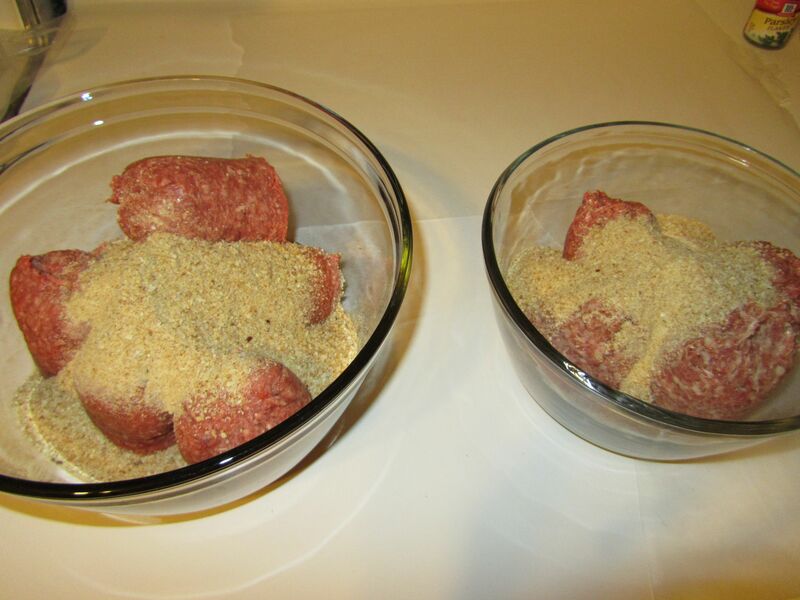 On the right, for meatballs, we have 1 pound each of maple breakfast sausage and ground beef, as well as 2 eggs. After mixing, divide the hamburgers into 6 patties per pound. 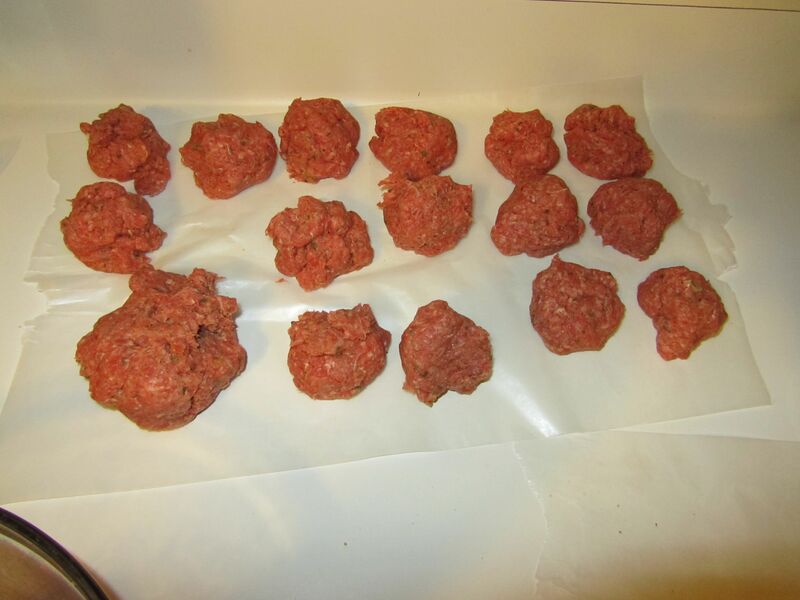 I made balls of the meat mixture and then flattened them into patties once they were in freezer bags. 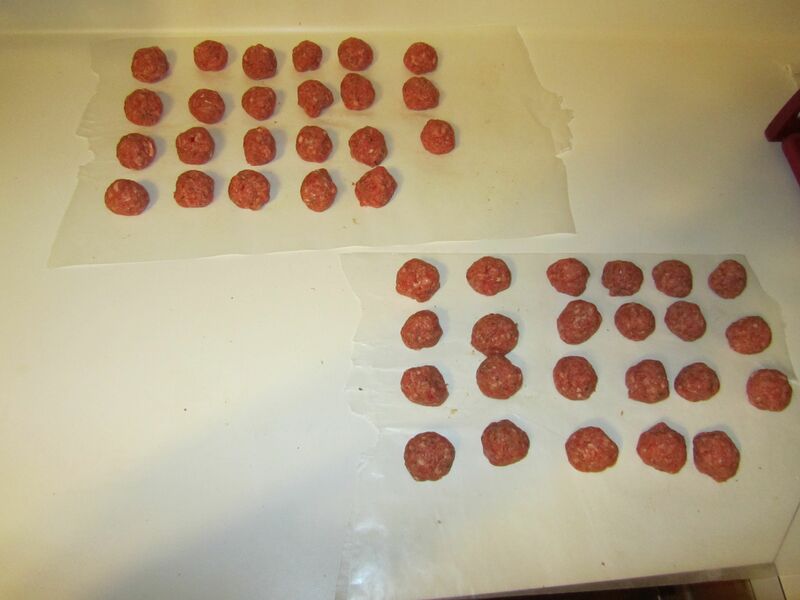 I used a cookie scoop to divide out the meatballs into 48 meatballs (this picture shows 46, but I took meat from other meatballs to make 2 more). 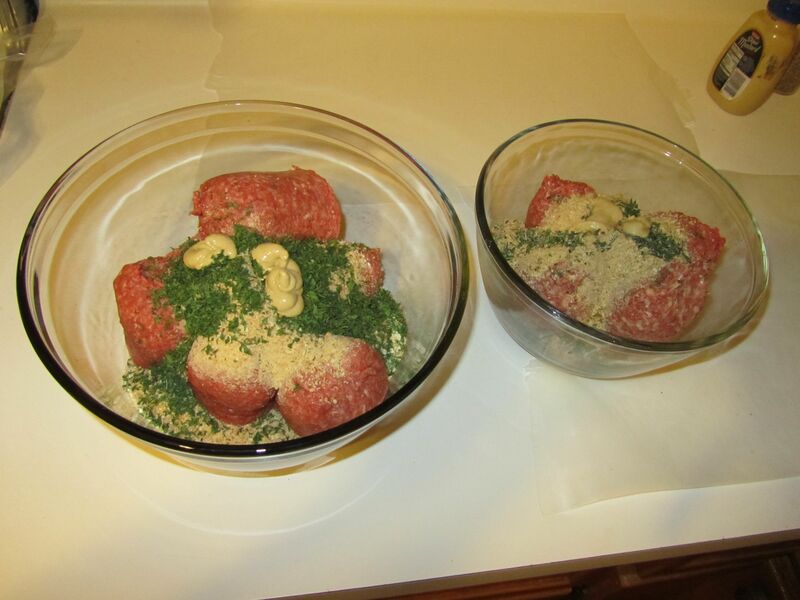 After using the cookie scoop, I made each meatball round by rolling them in my hands. 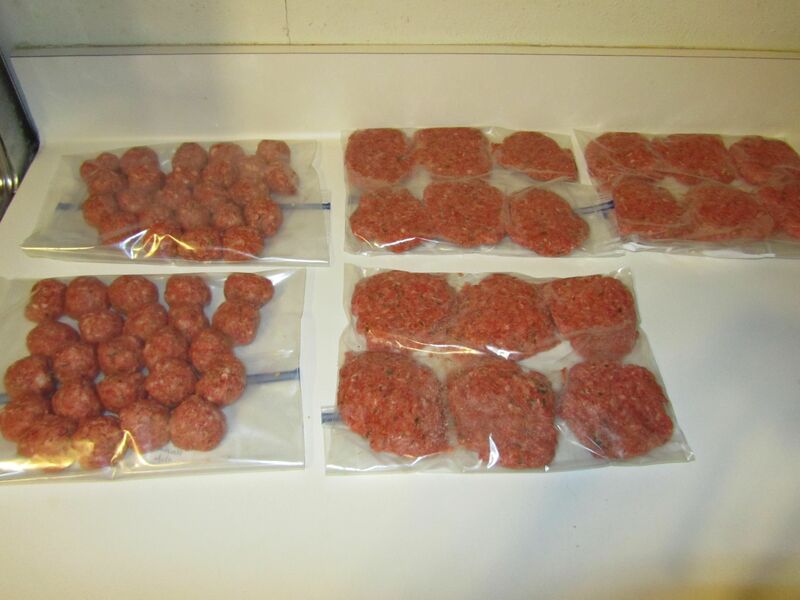 Here they are in the zip baggies, meatballs on the left and hamburgers on the right. 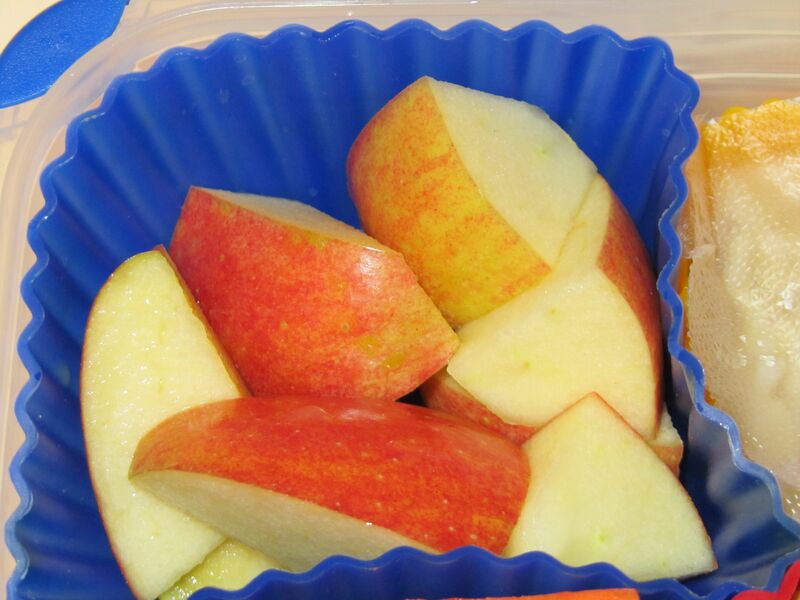 To cook them, take out the number that you want and defrost in the fridge or microwave. Pre-heat your frying pan (or grill) very hot and turn it down to medium when you put in the meat (with some EVOO). 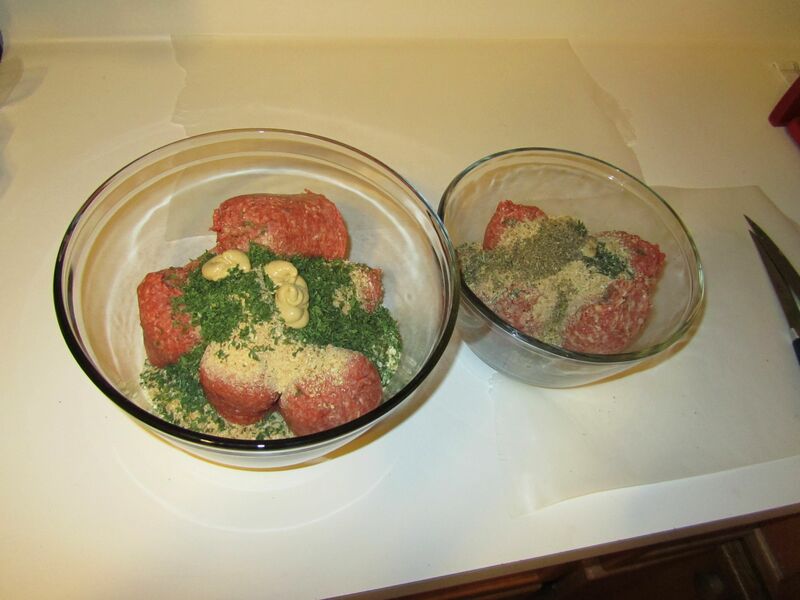 Cook the burgers about 3 minutes per side, and the meatballs until they are no longer pink inside (10 min. or less).